If you have planned to spend several days in Bansko, most likely you have already made your plans what you want to see while relaxing. We also assume that in your plans, you have included sightseeing in the town, trips to popular places such as “Sveti Nikola”, perhaps climbing the Vihren peak (if you have planned a visit in the summer) or entertainment on the ski runs (if you relax during the ski season in Bansko). Indeed, the resort town has what to offer you and you will be by no means bored, but you do not think that there is nothing yet to surprise you, do you? If you love pleasant surprises, we are here to add one more great landmark to your list of visits while you are on a vacation in Bansko. Situated in the “Kalyata”, only about 5 km away, south-west from the resort town, Sitan kale is among the largest in area of the fortresses which are uncovered in this region. The fortress is а late-antiquе and according to the experts, it was erected in order to protect the Razlog valley and more precisely – the Roman road, which passed along the valley of Mesta in Pirin Mountain and reached the valley of Struma River. The first information about the Sitan Kale reached us thanks to the Byzantine chronicler Georgiy Kedrin, who described it like a “remarkable town”, which according to the archaeologists speaks for its great significance and the important role that it played for the safeguarding of “the way of the caravans”. The fortress is located in a strategic place which allows a quick movement, surveillance, and security. It was built on a hill surrounded by steep, inaccessible slopes, and is in the form of an irregular rectangle. Also, at the beginning of the excavations in the area of Kalyata, the archaeologists were surprised not only by the dimensions of the fortified settlement but also by the large number of coins, vessels, weapons from different periods of time which were found there. In view of the dates of the uncovered artefacts, it was established that the settlement had existed and had performed safeguarding duties during the period from the III century right up to the XIV century. 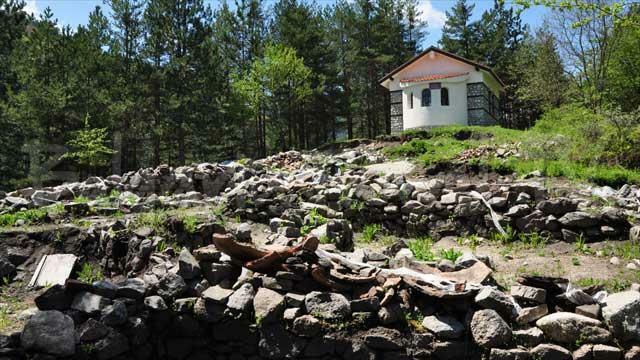 Experts say they had information that in proximity to Bansko, there was a fortress, but thought that it was a small fortifying facility erected by the local population for defence. By the excavations carried out, however, it became clear that the fortress covers quite a large territory from about 10 decares, on which, there were numerous residential and public buildings, churches, defence towers and watchtowers; there have been assumptions that there had been even a prison and customs. The fortress walls, which girdled the powerful fortress had a thickness of up to one meter and a half, and a few meters away from them, still can be seen the tracks of the moat, which surrounded the Sitan Kale. The fortress explorations ended in 2013., and if you decide to visit it, you will be able to view the uncovered citadel, the two defence towers (partially saved), the fortress walls, built with splintered stones, mortar, and crushed red bricks, remains of numerous buildings. We already mentioned that in the village, there were lots of artefacts uncovered from different periods that you can view in the arranged exposition in the Historical – ethnographic complex “Radonova house” in Bansko. During the Ottoman invasion, the ruler of the fortress Sitan Kale was ban Banko. He ruled wisely and fairly and looked after the population who lived dispersed, in small, separate neighbourhoods near the fortress. When а danger threatened Bulgaria, from the Ottoman invasion, the ruler built a water-main, so that to ensure sufficient water supply, and filled the warehouses with food stocks. All this was done, in order to be able to defend the population and the fortress, to withstand a long siege. When the Ottoman hordes reached the fortress, the population was protected and ready to withstand the several-months siege. And so it happened … the Turks surrounded the Sitan Kale, but there was no way that they could conquer it with force nor take the people outside. Few months passed until, in the end, the Ottomans came to an idea of how to cope with the disobedient Bulgarians. They found a donkey and fed it for several days, without giving it to drink water. Then they took it to the fortified walls of the fortification and left it. The donkey was so thirsty, that it soon started to rootle around the wall and thus the Turks found where the conduit of the fortress passes and cut it off. Left without fresh water, the fortress soon fell, and many of its defenders were killed mercilessly. In an unequal battle with the Ottomans fell ban Banko himself. However, the King had a daughter – Todorka, who took over the defence of Sitan Kale to the end. The lass fought fiercely, but the Turks outnumbered her small squad many times. Not to fall into the hands of the invaders, Todorka mounted her horse and raced to Pirin mountain she jumped from a high peak, which today bears the name of Todorka. Why do we tell you the legend of ban Banko? Because according to a large number of Bansko people, their town was named after the ruler of Sitan Кale. Whether it is true, we do not know! But the legend is so romantic (and dramatic) that it is a sin not to tell its story. How to get to the Rozhen Monastery? 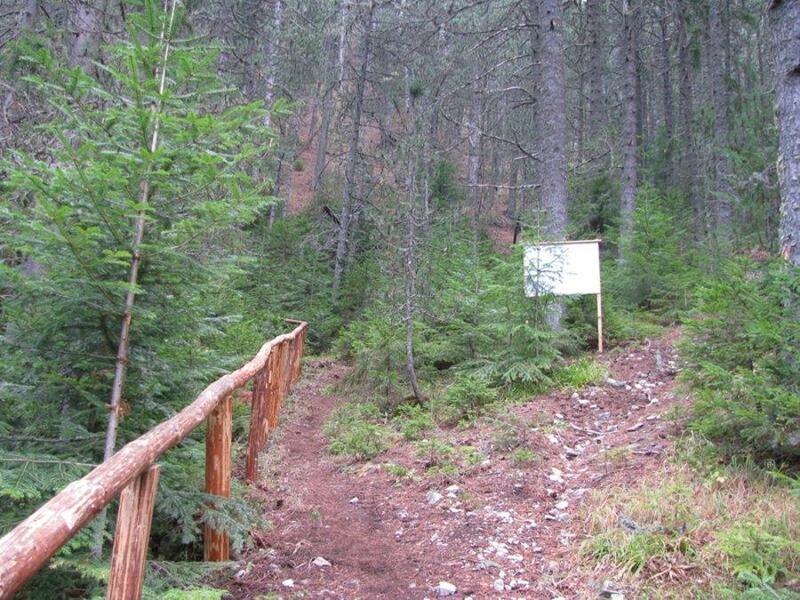 If your departure point is Bansko, you have to take in direction of Vihren chalet. As soon as you exit the town, take the first right in direction of the “Caves” restaurant. Keep calm, there are signs. When you get to the “Caves”, you need to drive another 1 kilometer and you will get to the river Glazene bridge. Here you have to leave your car and continue on foot. Pass by the bridge and after about 200 meters, you will see a sign about the fortress. Take the trail and in about 30 minutes you will be there. It is good that the trail that leads to the Sitan kale is secured with beautiful wooden railings and for a convenience of the tourists the terrain is adjusted and steps are made. The distance from the hotel Lucky Bansko to the bridge where you must leave your car is about 10 km and it will take you about 20 minutes. Then you are in for a pedestrian transition of about 30 minutes, which means that only after one hour at the most, you will be able to view the fortress and enjoy the views to Bansko, which reveal from it. The fortress is easily accessible for visits during the summer, as well as during the ski season in Bansko. 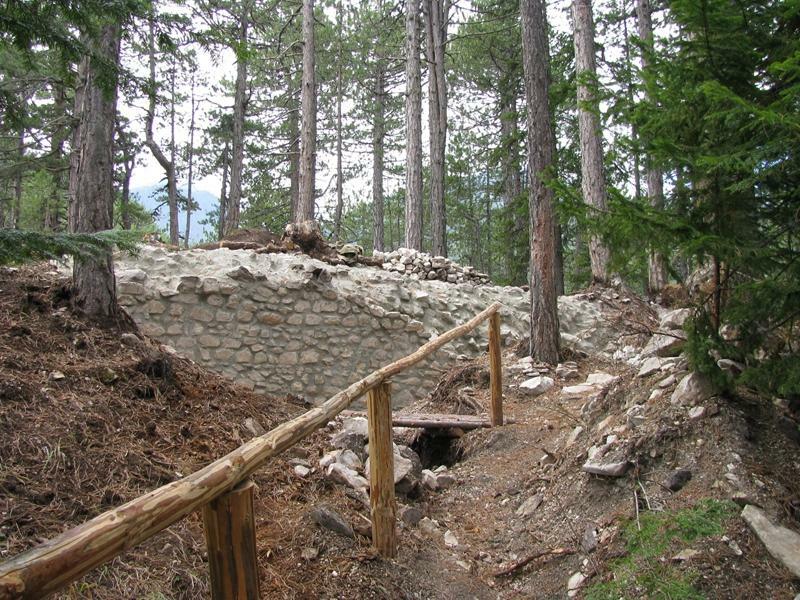 If the hiking in the Pirin Mountain is to your liking, or you love to visit the archaeological sites, then a walk to the Nameless town in the “Saint Nikola” area, will appeal you very much. Interestingly, both the Nameless Town and the Sitan Kale fortress are naturally fortified settlements that had carried out a security role. The Nameless Town, unlike the Sitan Kale, for which, there was some preliminary information, was discovered quite accidentally during the restoration of the “Saint Nikola” church, which rose on the eponymous hill. The town excavations started in 2003 and from under the earth, in front of the archaeologists’ eyes, a huge town revealed, which was located on an area of 25 decares, in which life had boiled for more than 3500 years. During the archeological research massive fortress walls, a basilica, numerous buildings, and the most interesting – graves, were uncovered, in which people were buried, with impressive for that time height of 1.80 to 2.00 meters. You can get to the Nameless Town if from Bansko you take in the direction of Dobrinishte. After about 1.8 km, you will see a sign, which will show you the direction, and which you must follow. By car, you can get to the foot of the Archaeological complex, then you must walk for about 20 minutes on foot. Regardless of whether you are relaxing in the summer or you have come for the ski season in Bansko, if so far you have not taken time to walk to the majestic Baikusheva Fir, it is about time you did it. Baikusheva Mura (Fir) is at the age of 1300, that ranks it second in age after the 1650-year-old Granitski oak in the village of Granite. Found in 1897, by the famous forester Konstantin Baykushev, the ever-green wood of the black-fir type still impresses today not only with its age but with its dimensions as well. The long-lived fir is 26 meters high, its diameter is 2.2 meters, and the circumference – 7.8 meters. If you decide to include the Baykusheva Mura in your sightseeing list, of a landmark in the vicinity of Bansko, this is how you can get there. From Bansko, you take into the direction of the chalet Banderitsa. Once you get there, you cannot help but see the magnificent tree, as it is located only 300 – 400 meters above the chalet. The distance from Bansko to the Baikusheva Fir is about 10 – 12 km, and it will take you only about half an hour by car to get there. The vicinities of Bansko hide lots of surprises and you are in for great adventures, no matter whether you love visiting the resort in the summer when everything is green or would prefer to combine the ski season in Bansko with sightseeing. Whenever you decide to take to the resort town though, take time to visit the Sitan Kale fortress – it is definitely worth. It is worth climbing up to the “Kalyata” area, to walk along the thick fortress walls and to look downwards at the town which spreads literally under your feet. The view is indescribable!